Fitch Ratings has affirmed the Ukrainian city of Kyiv's Long-Term Foreign- and Local-Currency Issuer Default Ratings (IDRs) at 'B-' and National Long-Term Rating at 'A-(ukr)', the outlooks are stable, reads a posting on the website of the rating agency. "The ratings reflect a weak institutional framework for subnationals in Ukraine (B-/Stable), still material foreign currency-denominated contingent liabilities and unsettled liabilities on the non-restructured part of Kyiv's eurobond. The affirmation reflects the city's moderate debt and consolidated fiscal performance with a sound operating balance driven by growing tax revenue on the back of an economic recovery," it says. "Fitch expects Kyiv's financial performance will remain satisfactory over the medium-term with an operating margin moderately declining to 22-24% after an exceptionally strong performance in 2015-2017. Performance will be supported by the economic recovery and steady inflow of current transfers from the central government. However, it remains fragile due to the overall weakness of sovereign public finances and unpredictable fiscal changes amid continued uncertainty over the pace of macroeconomic stabilisation. In 2017 the operating margin was 31.4%, slightly below an average of 38.8% in 2015-2016, as operating expenditure grew rapidly to compensate for the delay in inflation indexation in previous years," Fitch stated. "Fitch expects the city will continue to have a close-to-balanced budget over the medium-term. After a budget surplus in 2015-2016, Kyiv recorded a moderate deficit before debt at 1.55% of total revenue in 2017, which was funded by accumulated cash, so the city did not incur new debt," the agency experts said. "Following material fiscal surpluses and rapid revenue growth over the last three years Kyiv's direct risk has been declining to a moderate 26.1% of current revenue in 2017 from a peak of 67% in 2014. However, the debt is fully dollar-denominated, exposing the city to FX risk. At end-2017, direct risk included $101.15 million of the non-restructured part of Kyiv's $250 million eurobond and $351.1 million obligations to Ukraine's Ministry of Finance (MoF). 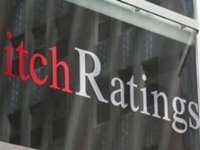 Fitch assesses the prospects of non-restructured debt settlement as uncertain over the medium-term, given the slow pace of Kyiv's negotiations with bondholders and the moratorium that was imposed by central government," according to the document. "The liabilities to the MoF arose as a result of the exchange of Kyiv's eurobonds into Ukraine sovereign debt in December 2015. According to the terms of debt exchange Kyiv makes semi-annual payments to compensate the coupon payment related to this debt servicing and should repay the principal in two equal instalments in 2019 and 2020. This exposes the city to refinancing needs of $351.1 million (equivalent to UAH 9.85 billion at end-2017). However, following negotiations with the Ukrainian government the principal amount at due date will be reduced by UAH 1.9 billion (equivalent to Kyiv's repayment of domestic bonds series G in November 2016), and by the amount of Kyiv's capex on bridge and metropolitan construction (about UAH 1.1 billion in 2017 and up to UAH 3.9 billion in 2018). Fitch expects the city will continue negotiations with the central government in offsetting the remaining liabilities," the agency stated. "Other obligations of Kyiv are UAH 3.7 billion of interest-free treasury loans contracted prior to 2014. As these loans were granted to the city to finance mandates delegated by the central government and will be written off by the state in the near future Fitch does not include this treasury loan in its calculation of direct risk," it said. "Kyiv remains exposed to contingent risk stemming from public sector companies. The city had several outstanding guarantees totaling about UAH 1.8 billion as of end-2017 to support projects in public transportation, infrastructure and energy-saving. Most of the guaranteed loans are euro-denominated and relate to two city-owned companies, Kyivpastrans and Kyiv Metropoliten. The guarantees expire in 2018-2021 and Fitch is of the view that the companies will service their debt by themselves," the report says. "Kyiv benefits from its status as Ukraine's capital and remains the largest and wealthiest city in the country, historically accounting for more than 20% of the country's GDP. Its economy is diversified across manufacturing and services, and supported by a large number of major national and international companies. However, Kyiv's economy still significantly lags from the international peers, which justifies our assessment of the economy as weakness. In 2017 the Ukrainian economy continued its mild recovery with an estimated GDP growth of 2%. Fitch expects Ukraine's GDP to grow 3.2-3.7% in 2018-2019, which should positively impact Kyiv's economic prospects," Fitch said. "Ukraine's long-term financial planning is still in early development, while Kyiv's debt management lacks sophistication and the city still faces unsettled overdue liabilities. The city administration's planning horizon is limited to one year, which hinders the forecasting ability of administration and makes the strategic planning difficult. Overall, the Kyiv's administration operates under a frequently changing legal framework, which requires swift response to potential new developments," the posting reads. "Ukraine's institutional framework lacks clarity and sophistication, hindering long-term development and budget planning of subnationals. The national government is under pressure from a challenging reform agenda imposed by the IMF to secure external funding. Political risks, which stem from powerful vested interests and fragmented political parties, are growing ahead of presidential and parliamentary elections in 2019. High, albeit declining, inflation and interest rates make debt and investment policies challenging," it says.